Dec. 5, 2017 - An intense orange light frequently glows in Quebec’s Northern Lac Saint-Jean skies – a sign of industrial development. But unlike the forestry or aluminum development the region is used to, this time the glow is all about cucumbers. In fact, the light is from a massive, $38-million greenhouse project spreading over 8.5 hectares of land. Inside, state-of-the-art Dutch technology produces 360 cucumbers per square metre, much more than the forecasted 275 per square metre. 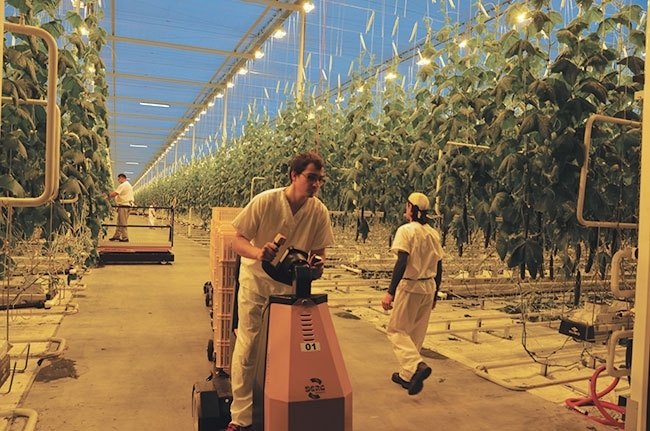 “It is now the most productive greenhouse in Canada,” says Eric Dubé, Toundra Greenhouse general manager and investor, comparing the productivity to Quebec’s average (80 cucumbers per square metre) and Canada’s average (200 cucumbers per square metre). This means the yearly production, which began last November, will be even higher than the 45 million cucumbers projected. At the greenhouse’s commissioning on Dec. 14, 2016, the crowd celebrated the creation of 200 new jobs in the rural area. Local investors – Dubé and Caroline and Bertrand Fradette – are particularly thankful to Richard Garneau, CEO of Resolute Forest Products, who not only believed in the project, but also convinced his board to become a 40 per cent shareholder of Toundra Greenhouse. Quebec Premier Philippe Couillard, who is also the local MNA, was also a key player in the project. When I moved to St-Félicien, Que. in 2008 – a village of 10,000 people about 450 kilometres north of Montreal – the greenhouse, or agro-thermal park, dreamt up by St-Félicien mayor Gilles Potvin was already a latent project looking for an investor. Potvin began envisioning the project in 1989 when he was the town’s industrial commissioner. Back then, wood residues were a problem and people were looking for ways to create value with them. That’s when a co-generation plant idea came up. The plan was to turn the wood residues into power. Some were concerned, however, that 80 per cent of the power generated would be in the form of heat, which would go unused. Potvin then came up with the idea of an agro-thermal park. The extra heat could be used as an industrial economic development lever for a 30-hectare greenhouse hub and a 20-hectare industrial area for forest products. At first, the project looked perfect, but as time went by, wood residues gained value and became scarce as more projects arose and demand increased. From $5/ton when the plant was built in 2000, the wood residue price reached $18/ton in 2006. And since the co-generation plant negotiated a 25-year deal with Hydro-Québec at six cents per kWh, the plant’s future was at risk. 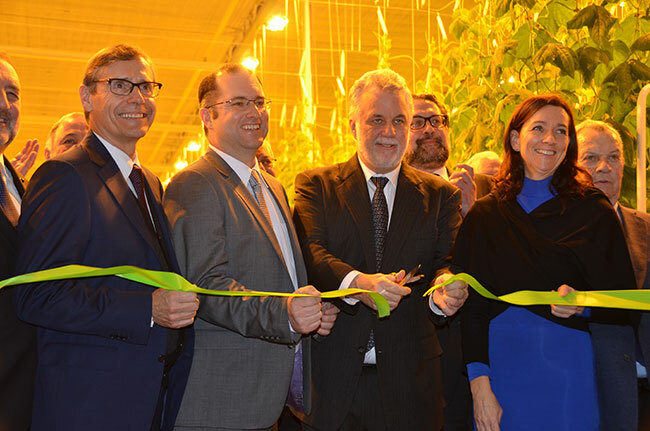 The Toundra Greenhouse was commissioned last December marked by a celebration for the creation of 200 new jobs in the area. In 2009, St-Félicien received a $5-million subsidy to build the heat-transfer infrastructure from the co-generation plant to a 28-hectare field they bought across the street. Many potential investors evaluated the project but nothing serious came about. Who would make a big greenhouse investment that relies on an uncertain energy source? Everything changed when Dubé – a Royal Bank investor from Montreal – moved to the region when the bank was investing in agricultural lands. The bank eventually dropped its investments, but Dubé stayed in the region to invest in a potato business and other agricultural projects. Dubé learned about the agrothermal park from the mayor and took interest right away in the ambitious project. He then met local investors, Bertrand and Caroline Fradette, who owned a lumber mill back in the 1970s and who were also interested in the project. In 2015, the co-generation plant was for sale and they prepared to make an offer, but Enel Renewable Energy sold their 21-MW power plant to Greenleaf Power. To find a reliable source of thermal energy they looked to the only other industrial partner with heat source available nearby: Resolute Forest Products. Resolute, the largest forest products company in Eastern Canada, has a pulp mill 15 kilometres away from downtown St-Félicien. When Dubé asked for a meeting with Richard Garneau, Resolute’s CEO, in February 2014, he was offered just 10 minutes for his pitch. “We ended up spending an hour together. This was the beginning of a successful relationship,” Dubé recalled at the greenhouse’s opening ceremony in December. Garneau said he was stunned by the proposal to make a business partnership that would grow cucumbers. His next question was about the market; he needed a business case if he was going to convince Resolute’s board to jump in. By July, Dubé got back to Garneau with a promise from grocery retailer Sobey’s to buy all their cucumbers. The promise was made by Yvan Ouellet, the Sobey’s procurement and merchandizing vice-president. From then on, Resolute agreed to be a 40-per-cent partner in the project and to allocate a field close to the pulp mill. But Garneau had some conditions. Local partners had to come up with a good business plan, the municipality needed to be a partner, the project must use an efficient and recognized technology, and the workforce should be found locally. “We believed in this bold and crazy project. And today, cucumbers produced here are sold in 450 locations in the province,” Dubé says. Sobey’s commitment helped secure the funding, but the hardships were not over. For example, the agricultural zoning had to be changed. Local acceptability was challenged when the mayor proposed to invest millions of dollars in the water-diverting infrastructure. Local construction workers also protested when Dutch workers came to build the greenhouses. But in the end, the project was completed according to the planned schedule and budget. This is in part due to the world-renowned greenhouse-making experience of Kubo and Stolze, the Dutch technology suppliers. Dutch consulting company AAB supervised all stages of the project. Kubo – which has also worked on other projects across Canada – received a $10-million contract with Toundra Greenhouse. In the greenhouses an integrated computer system controls more than 700 environmental parameters, including lighting, humidity, fertilizers, and CO2 level controls. To improve plant growth, extra CO2 coming from the natural gas combustion is injected in the greenhouse, increasing the concentrations from 340 ppm to 800 ppm. CO2 solutions, a company that specializes in carbon capture, plans to build its first commercial $7.4-million project to feed the greenhouses with 30 tons of CO2 per day captured from the pulp mill – the equivalent of 2,300 cars off the road. CO2 Solutions already has a 10-ton per day demonstration unit in operation, which uses an enzyme-based technology, says Evan Price, the company’s president and CEO. The project will be completed in 2018. CO2 is not the only byproduct coming from the mill. Twenty five per cent of the energy comes from the heat released in the pulp-making processes and the remaining energy comes from TK Topboiler natural gas boilers. Another unique aspect of greenhouse is that the plants are raised off ground supported by a stone wool artificial substrate. Those plants, which receive 20 hours/day of lighting, are irrigated and fertilized simultaneously – a process called fertigation – and all elements not absorbed are recycled. Likewise, 98 per cent of the water is recuperated from precipitations stocked in basins or recycled through the recirculation system. Toundra Greenhouse does not use pesticides and prefers to do integrated pest management. All of this is just the first phase of the $100-million project covering 34 hectares. It’s hard to say when the next phases of the massive project will be built, but the investors are optimistic. Other vegetables could make their way into the greenhouses as well. Subway just signed a contract to supply all 600 Quebec and 250 of Eastern Canada’s restaurants with Toundra’s cucumbers. For Gilles Potvin, this project exemplifies the birth of a new ecological industrial era, one in which waste can become a huge opportunity.